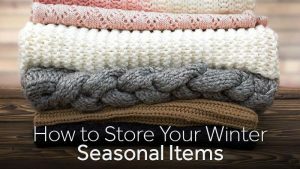 Unless you’re gifted with nearly endless storage space at home, you’ve likely already developed a pile of winter gear, clothing and holiday decorations you’d like to see gone. Instead of donating it all just to reclaim your space, try storing it carefully to prevent damage and wear. These seasonal storage tips will help you organize your winter gear regardless of where you choose to keep it. Everything from heavy down comforters to sweaters and shoes should be thoroughly cleaned before going into storage. Packing slightly damp or lightly worn clothing into a sealed container leads to mold and mildew. Storing shoes with de-icing salt residue or mud on them can lead to discoloration and damaged materials. Use a soft bristled brush on shoes or a damp cloth if the material permits it. Dry cleaning bags are inexpensive or free and look like a good way to protect clothing in storage, but any plastic bag can trap moisture. For clothing you prefer to fold, try plastic containers with tight fitting lids and a handful of silica-based moisture absorbing packets. Moisture leads to mold, which usually creates permanent stains and may eat through natural materials like leather, cotton and fur. For articles of clothing that need to hang, try cloth garment bags that seal tightly. The fabric allows some air to exchange while preventing moisture accumulation. 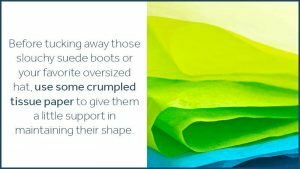 Before tucking away those slouchy suede boots or your favorite oversized hat, use some crumpled tissue paper to give them a little support in maintaining their shape. Even tucked away in the original box, soft items like boots tend to become deformed after spending a season or three in a crumpled or bent position. Once you’ve stuffed in just enough material to hold the correct shape, you can pack these items in far more tightly together in a larger container to save space. Plastic is the best option for containers that need to stack or fit under other items like tables and chairs. It works well for both clothing and personal items, but take care to find more tightly sealing containers for delicate goods like paperwork and books. For holiday decorations, look for large plastic tubs and try using smaller boxes and containers to separate light strings, collections of ornaments and other groups of decorations. Don’t forget to label your containers so you can find what you need in a hurry next fall. Zippy Shell Greater Columbus is the best choice for storing your winter gear, whether you only have a few boxes of clothing or an entire room’s worth of outdoor decorations in need of storage. Don’t forget about organizing your home for spring cleaning as well with the help of a portable storage unit sitting right outside your door.